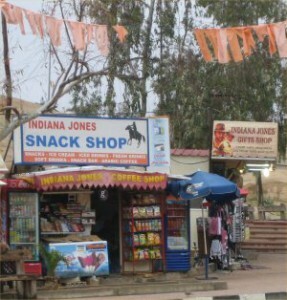 We arrive at Wadi Moussa, the nearest town to Petra. The trip had been exciting to this point, but this was different. Years before, my friend Yvonne, had returned from a trip around the world (in those days, I wasn’t at all inspired by travel, but I was excited for her). 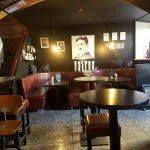 I had met her in a cafe in Glasgow, and she had shown me some of the pictures from her trip. One photo, was of the Treasury in Petra. It had left a mark on me, for nearly 20 years and the following day, I would finally get to see it. The hotel we stayed in, had the ubiquitous “Irish” bar, but although anything but authentic, it was actually quite a nice pub. In the picture are Ben, Nicola and Sue, who I got on with really well. 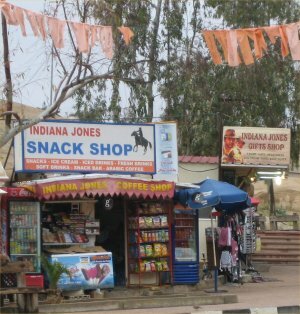 The tourist shops near the entrance, draw heavily on the fact that the treasury was used in the film Raiders of the Lost Ark. It was voted as one of the new seven wonders, and 800 of its monuments are listed is Unesco world heritage sites. 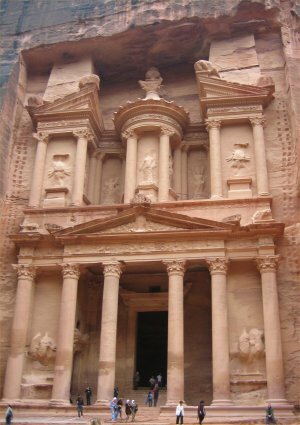 Petra gets its title “The Red Rose City” from a poem by John William Burgon. The last 2 lines are “Match me such a marvel save in eastern clime, A Red Rose City half as old as time“. 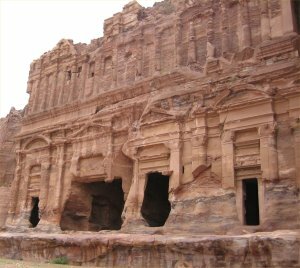 Problem is, when he wrote the poem, he hadn’t actually been to Petra, 16 years later, having seen it, he wrote to his sister commenting “There is nothing rosy about Petra, by any means”. There is an animal sanctuary nearby, where these horses are looked after once retired. The long-hidden site was revealed to the Western world by the Swiss explorer Johann Ludwig Burckhardt in 1812. 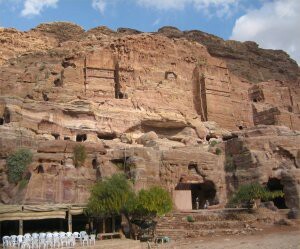 The City is 2000 years old, built by the Nabateans, it has also been occupied by The ancient Romans and the Bedouin. The eastern entrance leads steeply down through a dark and narrow gorge (in places only 3–4 meters wide) called the Siq (the shaft), a natural geological feature formed from a deep split in the sandstone rocks and serving as a waterway flowing into Wadi Moussa. 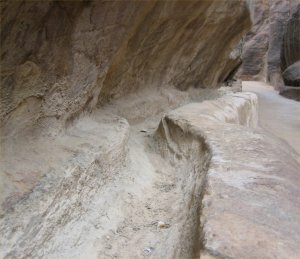 Along the sides of the Siq, are these channels, which at one time provided running water, and also a “safety valve” during flash flooding. It used to be covered, but long ago ancient floods washed away the cover stones. Excavations have shown it was the ability of the Nabataean’s to control the water supply that led to the rise of the desert city, in effect creating an artificial oasis. Archaeological evidence demonstrates the Nabataeans controlled these floods by the use of dams, cisterns and water conduits. Thus, stored water could be employed even during prolonged periods of drought. 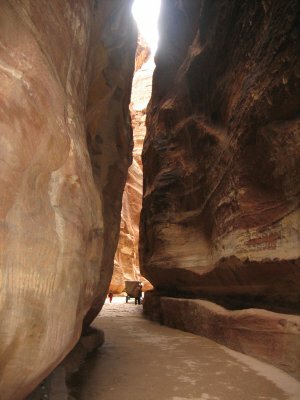 In this picture, you can see just how high, the walls of the Siq go (the bottom of the picture starts at about 50 meters). 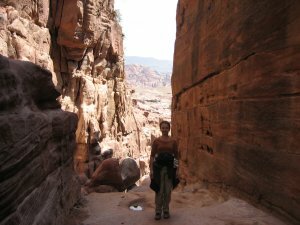 At the end of the narrow gorge stands Petra’s most elaborate ruin, Al Khazneh (“the Treasury”) hewn directly out of the sandstone cliff. For the fascinating details of how it was restored, click here. The Treasury’s original purpose remains elusive – except that it was not a Treasury. Some scholars believe it was a royal tomb, with the king’s burial place in the small chamber at the back; others, a temple, pointing to its temple-like façade and the lack of burial holes – for them the rear chamber was the sanctuary, complete with ritual ablution basin. Little has changed the Treasury since the Hon. Charles Irby and Mr. James Mangles, commanders in the British Royal Navy, described their first sight of it in 1818. “We do not know with what to compare this scene”, they added; “perhaps there is nothing in the world that resembles it”. 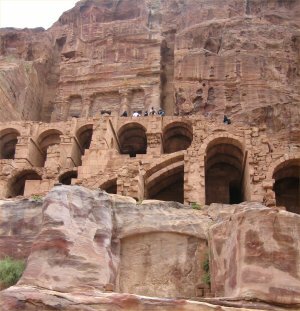 The Obelisk Tomb and Bab al Siq, Petra. It takes its name from the four Indian Obelisks along the top. The locals, didn’t waste any resource. 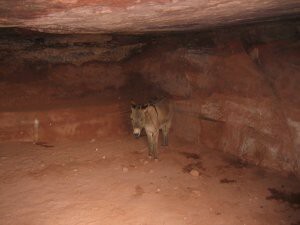 Here, a carved out room, was used to “house” a donkey, temporarily not needed to pull carts down through the Siq. In times gone by, a Bedouin family would have lived here. 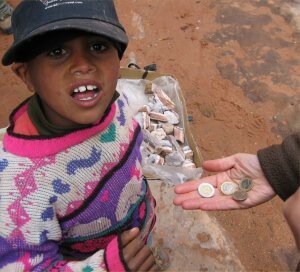 This child was wandering around, giving out Euro coins. We worked out, that he actually wanted them changed into some kind of usable currency. We exchanged them for Dollars, in return for allowing us to Photograph him. 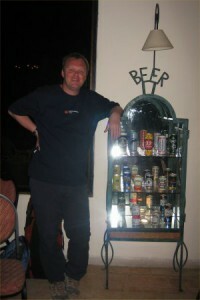 Some of the souvenirs, were a bit sublime (one shop was selling used, dead batteries). 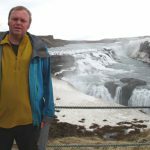 I was intoxicated by the moment, and ended up spending more than £100 on presents and souvenirs (I was so happy to be there, I didn’t even bother negotiating). 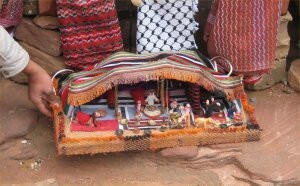 One thing I quite liked (couldn’t work out how to get it home) was this miniature Bedouin tent. The amphitheatre has actually been cut into the hillside and into several of the tombs during its construction. Rectangular gaps in the seating are still visible. Almost enclosing it on three sides are rose coloured mountain walls, divided into groups by deep fissures, and lined with knobs cut from the rock in the form of towers. 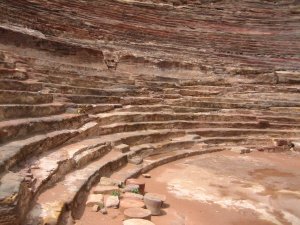 Theatre, which was constructed in the early 1st century AD by Nabataeans and enlarged and improved by the Romans shortly after their annexation of the Kingdom in 106 AD. This they did by ruthlessly gouging away a street of houses or tombs in order to extend the rear of the auditorium, which could then accommodate 3000 people. Elsewhere in the City, was this Byzantine Church. 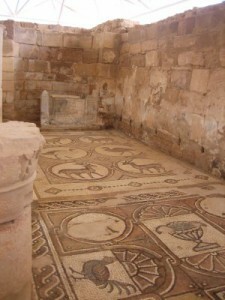 The floor had been re-constructed to show how it would have originally looked. For some reason, I look like I am missing one of my teeth in this picture. I am not. While travelling in Jordan, I had been reading “Married to a Bedouin”, the story of Marguerite van Geldermalsen, who visited the city while travelling (There was no internet or stuff like that, seeing the world in 1978 wouldn’t have been easy), married and fell in love with a souvenir seller, and lived with him in a 2000 year old cave. As I wandered around Petra I could here a distinct New Zealand accent, coming from one of the locals. I was delighted to meet Marguerite’s son Raami, who still carried on his fathers business (Mohamed, sadly died in 2003). There is a photo in the book, of a young Raami, in a red high chair, his father constructed. 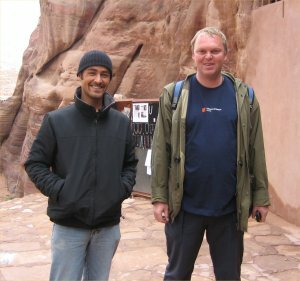 The first thing I said to him was “you’ve met the Queen” ((I knew from the book that Queen of Elisabeth II and Queen Noor visited Petra in 1984). I knew it was really him, as he replied yes, but I was asleep. We had a friendly chat, and he talked about his parents (it was a rare occasion, where I shut my mouth and let someone else speak !). I gave the space pen I had carried around the world to him, and asked him to give it to his mother. I told him that she was an inspiration to me. Although there are no longer any permanent residents in Petra (which explain the restaurant and modern toilet facilities in this picture), you can still see the cave where Marguerite lived with her family. 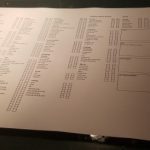 Its in the middle of the picture, slightly to the left. You can see how the caves were carved, one above the other, in places 4 stories high. The Urn Tomb was probably constructed around 70 AD. It is preceded by a deep courtyard with colonnades on two sides. High up in the facade there are 3 niches which lead on to small burial chambers. Their inaccessibility would have made them relatively safe from tomb robbers. Inside there is a massive single chamber which may originally have served as a triclinium for funerary banquets, but which was adapted in 446 AD to serve as a Byzantine church, the vaults of which can still be seen below the tombs. Front of the palace tomb. 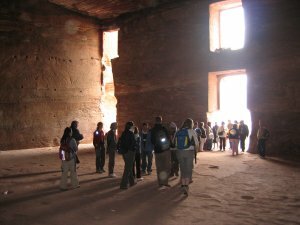 Inside the palace tomb, was this enormous room. How long must it have taken to chisel all of this sandstone out, and how, with primitive technology and tools, did they get the walls so straight. 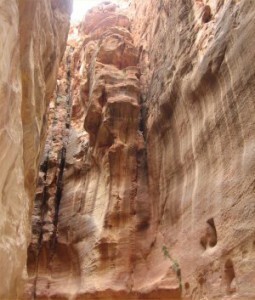 2000 years of high winds have eroded Petra’s sandstone, to create this effect. 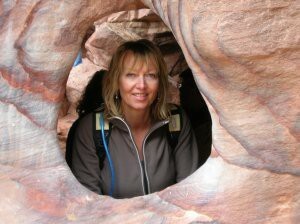 This is a classic Petra “hole in the wall” shot, featuring my friend Gill. 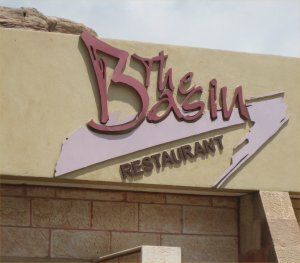 We go to the Basin restaurant for lunch. 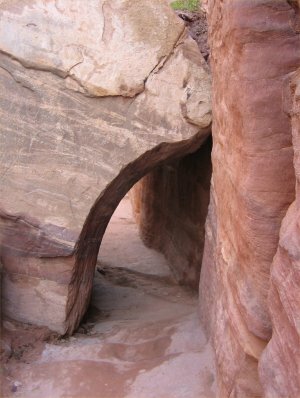 Long before the residents were moved from Petra, the Basin, was the only Hotel in the area, and was featured extensively in Married to a Bedouin. The Petra museum was right near here. 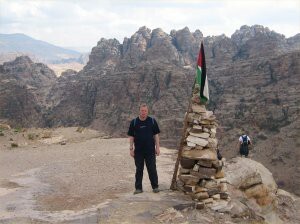 Okay it was interesting, but I couldn’t help wondering what the point was, when you are actually in Petra. 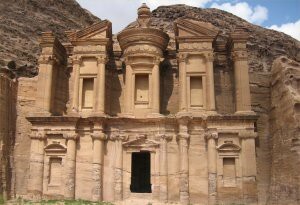 Perhaps a Petra museum in Manchester would be more appropriate :). We head up to the Monastery. Sue poses next to the striking rock, with a view back down to Petra behind. 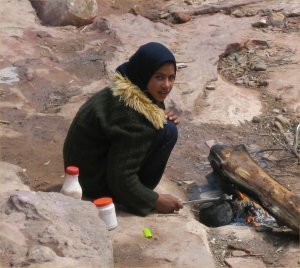 This Bedul girl was selling souvenirs, and was preparing some Tea for herself on an open fire. As I have said before, it always inspires me, when I see people using Bushcraft, which to me is a hobby, and to them, just a normal part of daily life. The Bedul are a small tribe of Bedouin who used to live in the caves in Petra until 1985. They farmed in the area and had their goats graze there before being expelled and re-housed in the village of Oum Seyhoun on the edge of the archaeological park. Now most of them make a living from tourism, renting horses or selling trinkets. As we walked up the hill, we pass through this naturally occurring “doorway”. Petra’s largest monument, dates from the first century BC and was dedicated to Obodas I. The monument is known locally as Ad-Deir, and like the Treasury, probably wasn’t a Monastery. To get an idea of its size, the doorway, is 8 meters high. 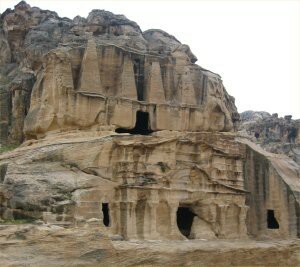 An enterprising entrepreneur, has converted the cave opposite into a cafe (the Monastery is 200 meters above Petra, and nearly an hours walk from the Basin restaurant). To the North of the Monastery, is this plato, with astounding views of Petra and the mountains around. Having spent the day in Petra, we are given free time. I spend the next 2 hours, walking slowly back to the hotel. The danger in situations like this, is that the expectation of seeing something might be greater than the reality (I’m thinking of Kathmandu and Prague) but this wasn’t the case. 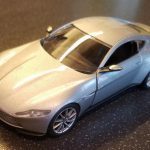 Was it worth the 20 year wait ?. Most definitely. 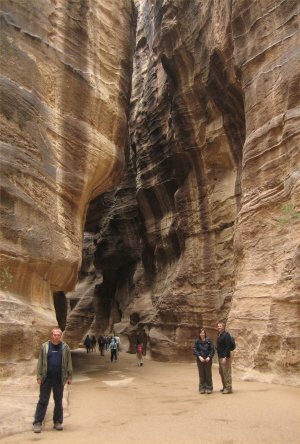 Petra was not surprisingly, the last destination on the Pyramids to Petra tour. By now my reputation had got around the group, and as a farewell, I was invited to pose in front of this cabinet with several different beer cans in it (the significance was not lost on me). When I arrived back in London, Ralph and Aud gave me a lift, all the way back to Liverpool, which saved me about 8 hours of the day, and I would just like to say thanks.